Greenhouses, while known for their warm environment that helps plants grow and mature quickly, actually need to be cooled properly or the temperatures inside may become too high for the plants as well as the people working inside. On the flip side, temperatures should also be controlled to ensure that the interior of the greenhouse does not get too cold. Proper management of the temperature is a critical element of the success of the greenhouse. Use fans throughout the greenhouse during warm months to circulate air throughout the greenhouse and keep temperatures regulated. Fans may dry out plants in the immediate surrounding areas and soil moisture levels should be monitored. Fans should also be placed near cash registers in commercial greenhouses to keep the equipment dry and to circulate air for employees. Install ventilation throughout the greenhouse. Typical venting methods include side vents that have attached fans to draw heat out of the greenhouse, or automated roof systems that open the roof a few inches to allow for air circulation. It will be necessary to contract with a professional to install this system unless you have prior experience working with ventilation systems. Install thermometers at each end and in the middle of the greenhouse. Monitoring the interior temperature and humidity levels of the greenhouse is very important. These temperatures should be checked several times throughout the day, particularly during the afternoon when temperatures and sunlight will be at their highest levels. If the ventilation system is not automatic, the vents should be turned on or opened if the temperatures rise above 82 degrees Fahrenheit. Temperatures should not dip below 50 degrees during the night. Install a thermostat venting control system. This particular method to control greenhouse temperature levels is typically quite successful as it does not rely on human control and will turn on automatically when temperatures get too high or too low. Large operations typically need an automated system to keep interior temperatures at the correct levels. Use an evaporative cooling system. 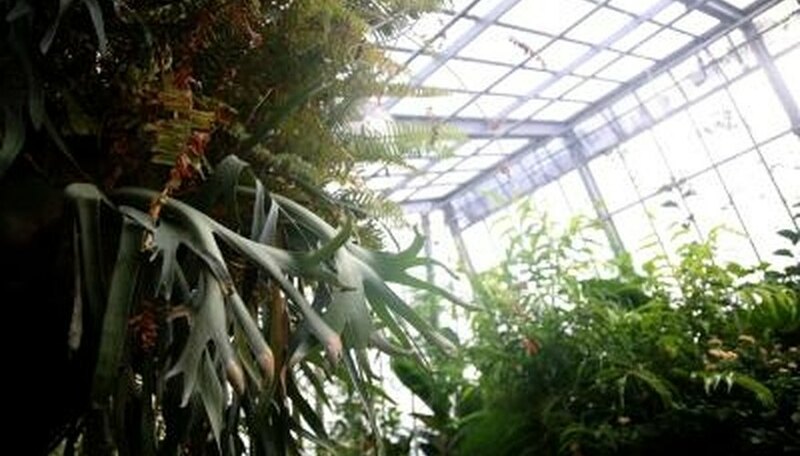 This type of cooling system is ideal for a greenhouse because it uses water to cool the air. The vast majority of greenhouse plants thrive in a moist, humid environment, and this type of cooling system will help keep air temperatures constant. Evaporative cooling systems are recommended for greenhouses in hot and dry climates.